In this post we examine five of the best-selling curtain rods. If you don't know, curtain rods are useful for hanging curtains over windows (duh!). They're also great for blocking out light and give homeowners privacy. The rods themselves are often made of metal, but can also be made of wood or other materials. Traditionally, curtain rods are designed to fit a variety of window widths by utilizing extending rods. Many homeowners overlook how much style can be added to a room with a simple curtain rod (Source). They're normally installed by mounting to the wall and, provided you make proper measurements, installation shouldn’t take too long or be too difficult. Some are mounted by tension (the RoomDividers is our favorite tension option) and adjust to fit within the frame. Of the 5 curtain rods we looked at, four are of the tension variety, which are ideal for renters who aren’t allowed to drill into their walls or for those who aren’t very handy. The exception is the Kenney Heavy Duty Double Curtain Rod. It require some drilling to install and is ideal for windows from 84-120 inches. 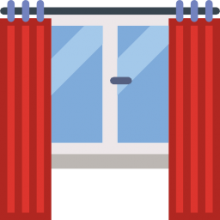 Buyers say it's relatively easy to install, however some buyers suggest that they’re not sturdy enough for very heavier curtains. Of the tension rods we looked at the Room Dividers Now Premium Tension Curtain Rod rated high due to the length to which it extends. Buyers said installation was quick, easy and the company offered good after the sale support. The major negative is a constant with tension rods and that is that they’re typically unable to hold very heavy curtains. Better than average customer support. The Kenney Twist and Fit with Petal, 28-48 inch is perfect for smaller windows but users day it’s not ideal for corner windows. The satin nickel finish is very modern and elegant. 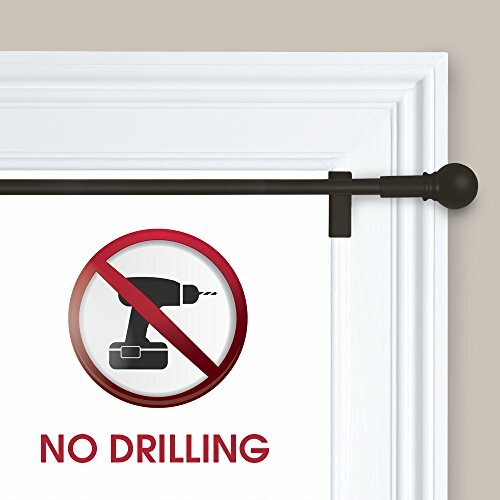 No drilling required. If you’re looking for something more elegant, the Maytex Twist & Shout Smart Window Hardware Rod features an oil rubbed bronze look that’s a bit more classic and upscale. It’s a tension rod so no drilling is required, but some buyers found installation to be difficult due to the end piece not staying tight. Also, not recommended for double windows. Lastly, we looked at the InterDesign Forma Constant Tension Rod, which is a functional, no frills design that’s perfect for those on a budget. It comes in brushed stainless steel and is ideal for closets or small windows or in the shower. 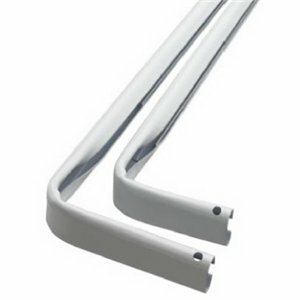 Some buyers report difficulty in installing this rod due to the end pieces being made of cheaper materials, while others mentioned the overall lack of durability with this product. The Kenney Twist and Fit Curtain Rod is a solid option if you want to install a curtain rod without the use of tools and without making holes in your wall. Users like the convenience of this rod,but some do complain about the cheap construction. This product is a twist-and-fit curtain rod that combines the look of a café rod with the function of a tension rod. It has an elegant ornament in the shape of a petal in satin nickel which would be a great accent to any room’s décor. The purchase includes 1 satin nickel rod set with finials and brackets. This item might be a solid choice if you’re looking for a curtain rod for light-weight curtains, draperies or sheers. In general, buyers have a favorable opinion of the Kenney Curtain Rod with Petal. They agree that it is very easy to install and very convenient. Users state that it feels sturdy and fits great. However, some buyers complain that the rod is cheaply constructed and flimsy. Some dissatisfied users share that the item is not as long as advertised. One purchaser says that it doesn’t work if there is a frame around the window. The MAYTEX Twist and Shout Curtain Rod might be a solid option if you want a curtain rod that is removable and easy to install. Users like the simplicity of this curtain rod, but some do complain about the poor execution. This curtain rod features a new superior hold technology that requires no drilling into your walls or wood trim. 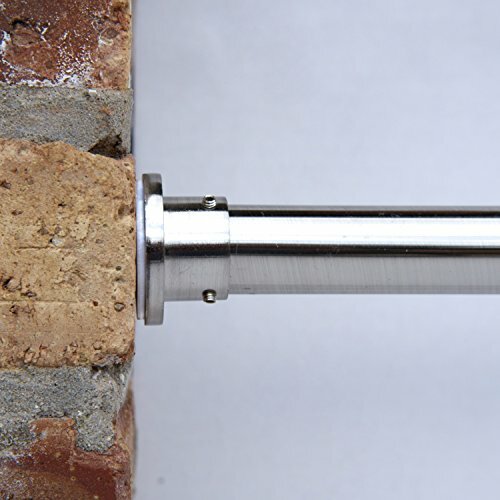 All you need to do to place this rod on your wall is to extend it, lock, and twist. It holds up to 20 pounds and is adjustable from 48 to 84 inches. This item could be a solid choice if you are a renter because you can simply unlock and take it with you to your new home. In general, users have a favorable opinion of the MAYTEX Smart Window Curtain Rod. They agree that this rod is a perfect solution for not screwing holes into the wall. Users like that it is very simple, effective and durable. Even though buyers agree that this no-drill curtain rod is a good idea, some complain that the design is poor. They share that the cheap plastic screw can break easily when you tighten the rod. Also, several users complain about the hard installation that takes two people. The Kenney Manufacturing Double Curtain Rod could be a solid option if you want an adjustable, telescoping curtain rod. Users like the value/price ratio of this rod, but some do complain about it being too fragile. This product is a heavy duty curtain rod made of steel with a rolled hemmed edge to provide strength and prevent snagging. It can adjust from 84 to120 inches and it comes with a mounting hardware. This curtain rod is perfect for light to medium weight draperies, curtains, sheers or valances. This item might be a solid choice if you are looking fora both functional and decorative curtain rod. 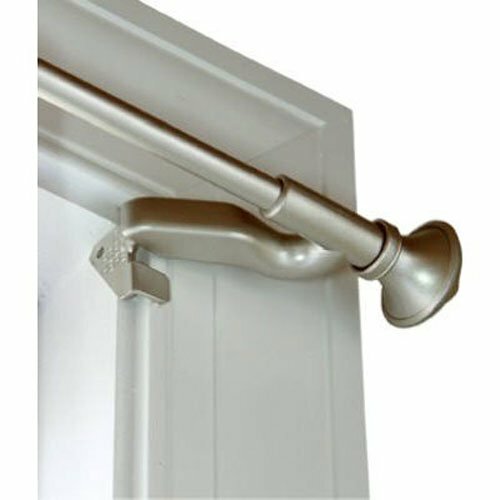 The general user consensus concerning the Kenney Manufacturing Heavy Duty Double Curtain Rod is that it is affordable and easy to install. Many buyers state that it is a good value for the price. However, buyers conclude that this is definitely not the sturdiest option available. Some state that it is very thin, flimsy and too fragile. Several users share that the rod is somewhat difficult to extend. If you are looking for a curtain rod, you might want to consider the InterDesign Rod for Window, Closet or Blackout Curtains. Most of the users are dissatisfied with the quality of this product, but some do find it to be functional. This product is a curtain tension rod which is suitable for bathrooms, kitchens, bedrooms, etc. it is made of stainless steel and plastic with a brushed finish. The item extends from 19 to 30 inches and requires no hardware for installation, which is quick and easy. You can choose between three colors (white, bronze and brushed stainless steel). This product might not be a good choice if you want a sturdy, high-quality curtain road that will hold an excessive load. You can choose between three colors (white, bronze and brushed stainless steel). This product might not be a good choice if you want a sturdy, high-quality curtain road that will hold an excessive load. In general, users have a low opinion of the InterDesign multi-purpose option and they conclude that it is really poorly made with cheap plastic materials. As they say, the end piece can break off very easily, even when the item is used for hanging a simple sheer curtain. Many purchasers state that it is flimsy and won’t stay on the wall. In addition, there are many online reviewers who share that they received a defective (bent or broken) item. However, there are others who state that it can hold up thick, medium weight curtains, without coming loose. Some find it to both look good and hold well. If you’re looking for a top-rated curtain rod, you might want to consider this one offered by RoomDividersNow. Users love the sturdiness of this curtain rod, but some do complain about it being poorly made. This product is an attractive, inexpensive, heavy-duty tension rod suitable for a variety of window and room sizes. It is made of hardened, annealed steel for reliable gripping power and ultra-strong tension. The installation requires no drilling since the rods are installed by using spring-loaded tension between walls and hold strong with clear rubber end grips. The rod is available in 4 colors: black, gold, silver, and white. If you want a strong curtain rod that is easy to pack and move, this item might be a good option. The general user consensus regarding the RoomDividersNow Premium Tension Curtain Rod is that it works great. They state that the rod is sturdy, easy to install and looks elegant too. However, there are those who complain about it being cheaply made. Several online reviewers state that the tension mechanism won’t stay in place, as well as that the item is flimsy. Since we spent so much time reviewing the best curtain rods on the market, we also thought it made sense to examine some peripheral issues regarding this home furnishing accessory. In particular, we were interested in how to select the best curtain color for your interior home decor. We defer to one of our favorite websites Maria Killam. When selecting one, many buyers are concerned with the size and the style as well as the material. She advises that you choose them so they perform an attractive contrast with the room they're installed in. In fact, she even compares rods to eyeliner- they're designed to provide visual depth without distracting attention to themselves. When it comes to selecting the best size, slim or narrow ones generally look more modern than flat and bulky ones. Though if they are thinner than 1 inch they can look somewhat cheap. Looking at Pinterest images, it's sometimes quite attractive if you have light-colored furniture in the room to choose a dark-colored style that adds striking accents. On the other hand, a white option would cause it to blend seamlessly into the background, a different visual effect that can be just as appealing. It can also make sense to get a full-length drapery rod that runs across multiple windows if you don't have a lot of space above the windows themselves. Sometimes if your interior decor already has a lot of contrast between the sofa, the rugs, the chairs, it doesn't make sense to add even more conflict by installing a contrasting color curtain rod. Another consideration is installing a decorative finial on the rods. This will depend on how much you like this ornamental enhancement. If you're like the editors here, they prefer selecting a timeless style so they are always up-to-date rather than selecting a trendy design that will look out of date in a couple years. If you happen to be hunting for the top curtain rod option, you can buy them at retail shops such as Target, Lowes, Home Depot, Ikea, Menards, Ace Hardware, Sears, Walmart, Harbor Freight, Walgreens, and even Costco. Another important consideration is the material. Many buyers were unaware that wooden curtain rods will actually bend over time and need to be rotated. That's why metal options are generally a more popular and long-term solution. Same Ones In Every Room? Another consideration is whether you should install the same rods in every room. This will come down to whether you can easily see into the next room and whether the interior decor there is the same between the different rooms in the house. So, if the rooms are separated it's easier to choose a different style and color for your rods than if your home has an open floor layout where different-looking rods would be readily apparent. An example of this is choosing different drapery and rod treatments for the kitchen and bedroom, opting for golden rods in the bedroom and espresso-colored options with brass pendants in the kitchen. One commentator described installing heavy white linen custom-cut draperies with pinch pleats in her home on Whitewood curtain rods. She concurred that the wooden ones do need to be rotated over time, but she is happy with the color contrast, also saying that as a California ranch home with really tall and soaring ceilings that the white curtain contrast with the wood was the perfect interior decor solution for her and her family. Another commenter raised an interesting issue- she said that as a cat owner her she couldn't install fashionable drapery in her home because her cats were likely to claw and scratch the curtain to death. Instead, she went with plantation shutters that are painted white complemented with valances. At the end of the day, if you don't have a great design aesthetic, you may want to consult with an interior designer to help you spruce up the interior of your home with the right color combinations.